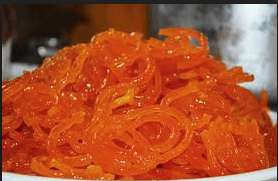 How to Make Jalebi Recipe? Mix flour, semolina or rice flour, baking powder, curd and 3/4 cups of water (preferably a ceramic bowl) in a bowl. Mix well with a whisk. Mix well and then add remaining water and 1/8 teaspoon. Saffron powder, and whisk until smooth. Set aside for fermentation for approximately 2 hours. Prepare a string syrup by dissolving sugar in water. Add the saffron and cardamom powder just before the syrup is ready. Heat oil in the embroidery To make coal, put the batter in a stove (or coconut shell with hole) in the embroidery. Make something at a time. Fry until they are golden and crunchy but do not brown. Remove from the pan and remove it on the kitchen paper and immerse them in syrup. Take the jelly out of syrup and serve hot. How to Make Bread Cutlet Recipe?